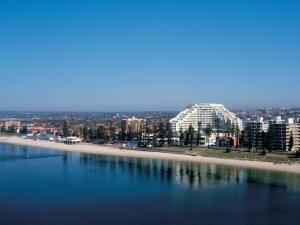 Located opposite the beach, this hotel enjoys sweeping views over beautiful Botany Bay, 15 km from Sydney city centre. Facilities include swimming pools and a spa. As well as its excellent location, the Novotel Brighton Beach also offers facilities such as an indoor and outdoor swimming pool. Stay fit with a session on the tennis court or in the fitness centre, before relaxing in the hot tub. The hotel's guest rooms are all modern in design, spacious and well furnished. Each has a private balcony with lovely views over the bay or the city. The surrounding Brighton Beach area has numerous cosmopolitan cafes and restaurants, as well as a shopping arcade. Sydney Airport is just a 5-minute drive away. General information: Novotel Sydney Brighton Beach has a range of facilities on offer including a landscaped outdoor swimming pool, indoor pool, steam room, a modern gymnasium, restaurant and bar, day spa and health centre and 11 function rooms with an experienced conference and events team to organise your next function. Bike tracks and running paths run parallel to Botany Bay. Important Information: Please note that there is a 1.5\% charge when you pay with a credit card.